Long, long ago* in a quilt shop far away, I bought a quilt kit. As 2017 is "The Year of the Baby" for anyone and everyone that I know, I pulled out every baby quilt kit in my abundant stash. I have many more baby quilts to make and deliver. 2017 is a great year! 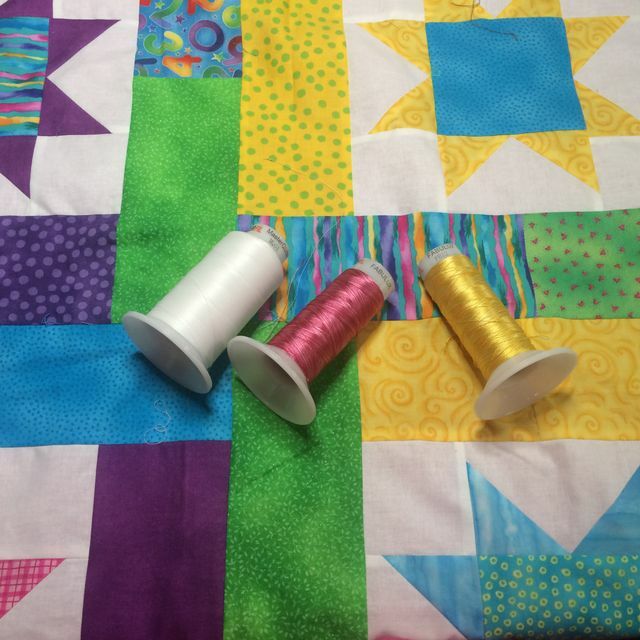 I haven't finished many quilts recently. This is probably because there are many quilts stacked high on my binding chair waiting for me to put the final stitches into them! I recently finished Lucky Stars, a fantastic pattern from Atkinson Designs. I can't wait to deliver this to sweet little Evelynn! *Get 50% off the full retail price of select Craftsy classes taught by Debby Brown - Instructor. Cannot be combined with any other coupons. Expires September 11, 2017. Sometimes, being a quilt designer is quite amusing. I named my newest pattern Tutti Frutti and repeated to myself "Tutti Frutti Cutie Pattern" as I was binding it. I can't say that ten times fast, nor can I say it one time slow, so I basically giggled my way through the binding. This was made using yummy, yummy Sew Batik fabrics. As someone who doesn't actually like batik fabrics, it surprised me to fall in love with Sew Batik fabrics. I can't wait to use more of their fabrics! * Coupon Details: Get 50% off the full retail price of select Craftsy classes taught by Debby Brown - Instructor. Cannot be combined with any other coupons. Expires September 4, 2017. I'm making a series of fabric postcards for a special little boy. I printed out an L in a fun font. I traced the letter "L" on Steam a Seam 2 and fused it to a scrap of fabric. I fused the letter to another scrap of fabric and I added some Tearaway Stabilizer behind the fabric, threaded my handy-dandy Handi Quilter Stitch 210 machine with In The Pinks FabuLux Thread in the needle and DecoBob in the bobbin. I tore away the stabilizer and fused some scrap backing fabric, Peltex, and my top fabric together. Another card, ready to mail! I sent the card off in a clear mailing envelope and am now planning which letter to make next. I'm tickled to announce a new Cutie Pattern release! I used Free Spirit's Butterfly Garden fabric and it was so So SO yummy!!! I think I need to re-make this quilt and am on the lookout for a fun strip or large print to use as the wide strip of fabric. I'll let you know when I find one. *Get 50% off the full retail price of select Craftsy classes taught by Debby Brown - Instructor. Cannot be combined with any other coupons. Expires July 20, 2017.